HIP Studio was born out of a friendship between two women with a love for fit living and high intensity workouts. South Bay locals Christine Crivello and Amber Susa Jewett were bored with traditional gyms and tired of having multiple memberships for specialty classes to get the workout they wanted. They shared a vision of creating a space with a true sense of community that had something for everyone and where fitness and health become a priority. Together with their unique backgrounds, they opened HIP to give clients workouts that are fun, effective and results-driven. As instructors themselves, Christine and Amber understand how valuable it is to have amazing trainers with the perfect blend of knowledge, passion and experience. Every trainer at HIP has 8 years or more experience and truly love what they do. You will find trainers that care and continuously push you to the next level. After years in sales and marketing in the music and fashion industries, Christine was ready for a change. Taking a Pilates class on a whim, she had no idea what it would eventually lead to. After a few classes, she was hooked and so inspired that she decided to get her PIlates certification thru BASI in 2010. That same year, she met Amber and the two opened HIP to bring their passion for teaching and workouts they love to The South Bay. Christine loves motivating clients and teaches them to move with purpose and control, giving them awareness that will reshape their body. When she is not teaching, she is working on new recipes and meal plans for The HIP90 Nutrtion Plan. She avoids fads and shows clients how to eat real food. She is certified in Pre & Post-Natal Pilates, TRX and is working on her Advanced Pilates certification with Vital Balance Pilates. Co-owner Amber Susa Jewett lives in Redondo Beach with her husband, Chris. An exercise enthusiast with a gymnastics and dance background, she chose to pursue her passion for health and fitness full-time after years of working as an actress and dancer. Amber is a certified personal trainer, speed & agility coach, TRX instructor, Zumba instructor, and STOTT Pilates instructor. Amber continues to explore new ways to challenge herself and others and is thrilled to combine her love for exercise with her passion to motivate and inspire to co-create the ideal fitness environment with her HIP Studio partner, Christine. Dorothy McGatlin grew up dancing in Arizona. In college, she danced for the University of Arizona Pomline and was president and a choreographer for the Repertory Dance Group at the University of Puget Sound. She moved to Los Angeles in 2005 as a member of Teach For America. With a background in dance instruction, she created the dance program at Los Angeles Academy Middle School in South LA and discovered her love for Pilates. Trained in the BASI Pilates method and a licensed Zumba instructor, she wants each client to get a challenging, balanced workout and leave feeling stronger and happier. Heidi is a California native, born in the South Bay. She’s excited to be back to her home after spending a few years living the Aloha in Hawaii. Living life to its fullest is Heidi's intention for life. A forever student of her body, mind and soul, Heidi has over 10 years of movement training and experience. She is trained in Pilates, Barre & Yoga as well as an Integrative Wellness Life Coach. In Heidi, you will find a happy, energetic and creative spirit that keeps her students motivated and her classes upbeat. She focuses her attention on each student, making sure the body is in alignment for every exercise. "I love what I do, because when I'm engaging a person and/or crowd, my spirit turns on and all of the chatter of my mind fades away to allow me to fully engage." Maggie has been teaching Pilates in the South Bay for over nine years. 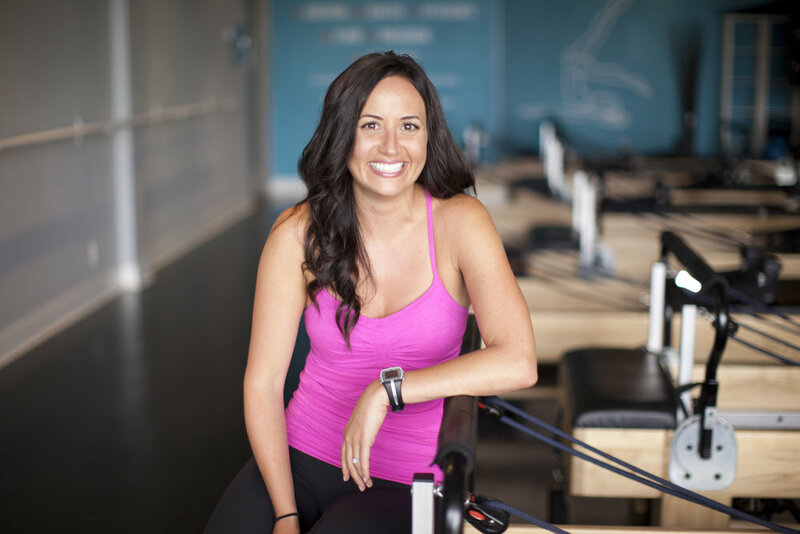 After falling in love with SPX Pilates in 2008 while working for a commercial production company, she earned her certification in the Lagree Method in 2009. In 2010 she finished the Body Arts and Science International (BASI) certification. In February 2015, Maggie completed the comprehensive Polestar Pilates certification, a worldwide provider of rehabilitation-based Pilates education. She also works closely with a physical therapist in the South Bay to use Pilates to aid rehabilitation for her private clients. She takes great pride in helping her clients get back on their feet and back to the sports they love and the exercise they enjoy.Her teaching style is fun, fresh,challenging and invigorating. Marla's fitness classes offer a playful-based mix of postures & movements. Having taken many of the finest study programs offered here in Los Angeles and around the country, Marla is certified in High Intensity Pilates and Yoga. Teaching since October of 2000, she brings enthusiasm, humor, compassion and intelligence to her teaching, leaving students empowered, refreshed, motivated, and restored. Originally from Michigan, Suzie Collis began her career as a fitness instructor. She moved to Los Angeles in 1992 and studied under first-generation Pilates instructor Romana Kryzanowka. Today, she continues her education by traveling the country taking classes and studying with master instructors. Suzie is dedicated to bringing new ideas to class to continually challenge students so they can reach their full potential. Her classes are challenging, motivating, unique, fun and fulfilling. Suzie focuses her attention on each student, making sure the body is in alignment for every posture. Students leave feeling worked, but their bodies are smiling! Tiffany was introduced to Pilates while in physical therapy for a shoulder injury. She immediately saw and felt the results in not only her shoulder, but in her entire body. After experiencing the benefits of Pilates for herself, she was inspired to share the Pilates Method with others. Tiffany earned her teaching certification in 2005 through the Pilates Institute of Southern California and has been passionately teaching Pilates ever since. She is experienced working with clients of all ages and all fitness levels, including disabilities and chronic conditions. Tiffany believes Pilates can offer strength and stability to ALL bodies, and is committed to helping her clients find the correct form and reach their fitness goals. She's the muscle behind the desk. Born and raised in the South Bay, Justine has been a client since HIP opened in 2011. Justine joined the team in 2016, bringing her smile everywhere she goes and making sure every client at HIP gets the best experience possible (and in the cutest pair of Toesox!). Lauren Potter grew up in the Bay Area, and has always found that staying active is key to overall health and happiness. She fell in love with barre when a friend encouraged her to tag along to a local class in San Jose. After moving to Los Angeles 5 years ago, she knew that she wanted to take her passion for barre to the next level. She earned her teaching certification in 2013, and has truly enjoyed helping clients of all ages and fitness levels experience the strengthening and lengthening benefits that a barre class has to offer. She is committed to providing an engaging and alignment based workout in each class, while most importantly, having fun.